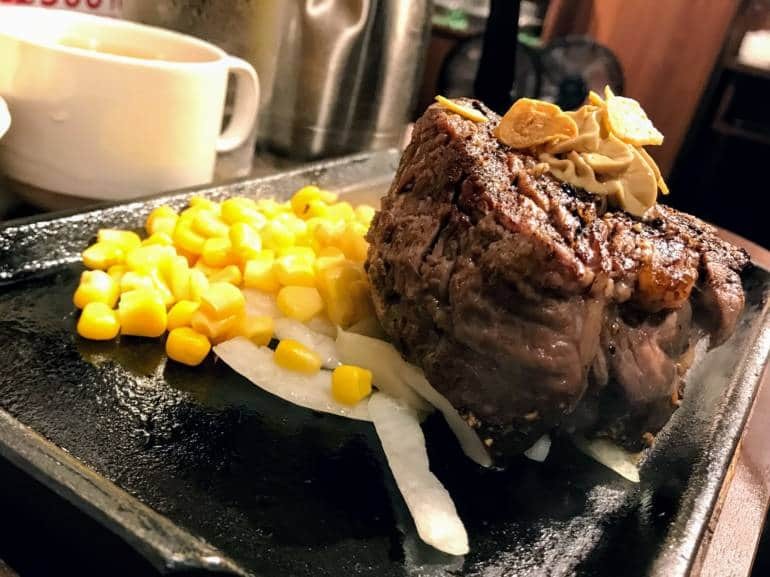 Roughly translating to “Sudden Steak”, Ikinari Steak is a zero frills, a “let’s get straight down to the meat, eat and get out” type of affair. The staff (with varying degrees of success) will explain in English to order your side set with them first, then take your number up to the meat counter to choose your meat. There’s only really three things to choose: 1) which cut of meat (sirloin, filet, or “Wild Steak” – chuck steak, 2) how much, and 3) how well you like it cooked. The butcher/chef will then plonk down a slab of meat, chop it to size and weigh it on the scales in front of you (all sold by weight). Of particularly hungry cheapo interest is the Wild Steak, with 450 g costing just under ¥2,000 tax in. 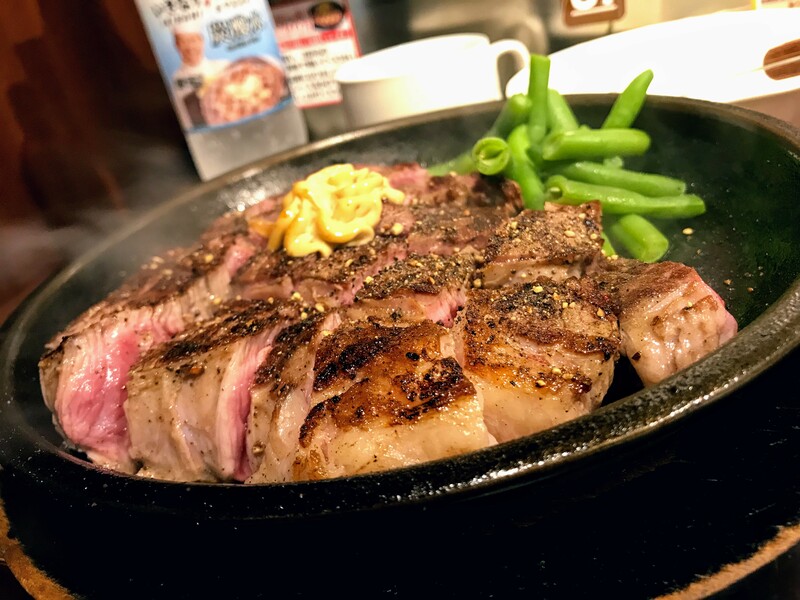 The meat is fresh and tasty—and while it’s not the highest possible quality of cut and flavor, it’s exceedingly good for the price and far outshines all of the cheaper steak options (like family restaurants, blegh!). Best avoid the bottled sauces unless you like the sweet yaki-type flavor. We recommend sticking to the mustard, wasabi and pepper as the steaks already come served with a little Béarnaise (or similar) sauce. If you’re on the carnivore diet and haven’t died yet, you should pick up a members “mileage card”. You’ll receive discounts and freebies the more grams (or kilograms) of steak you consume. Gold membership level requires only a few visits, platinum kicks in after you have consumed 20 kg of beefiness, and “Diamond” after 100 kg (easy, that’s only about 223 x 450 g Wild Steaks.